Mommy brought Gramma home with them on Sunday. They said it was an extra special Sunday, called Eeekster. They said that the sun had risen over 2000 years ago on this extra special day. I didnt get what the big deal was, because the sun rises EVERYDAY here. But then mommy said it was not the sun in the sky, but THE Son that leads her and daddy's life. She said when they close their eyes and look down, they are talking to The Son. I see them do that a lot, but didnt know what it meant. 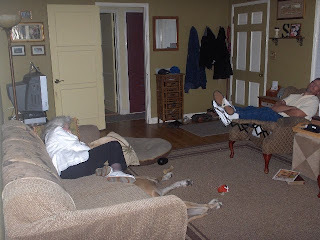 So while mommy stayed in the yummy room making treats, me and gramma and daddy closed our eyes and talked to the Son. At least, that is what I think they were doing! I am not sure about the EEEEKSTER day either, but snoozing in the family room is always a very satisfying activity. That looks EXACTLY like what we did on eekster except the store that sells ingredients for making treats in the yummy smelling room was closed (surprise!) so we got pizza. Looks like a happy eeekster all around!